Coal extenders are materials which will hold a coal for a long time. They are very useful for carrying fire for an extended period of time, perhaps while on the move. 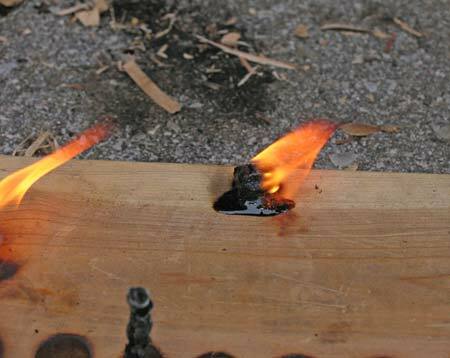 They could also be used when you are in the process of starting a fire, but don't yet have all the material needed to actually make the fire. The coal extender could be used to hold the coal while you go out and collect more materials. Or, let's say you find that your tinder bundle simply won't blow into a fire - perhaps it's too damp. A coal extender will allow you to go search for more suitable materials for a tinder bundle without having wasted all that energy you expended just getting the coal (say by using a hand drill or bow drill). 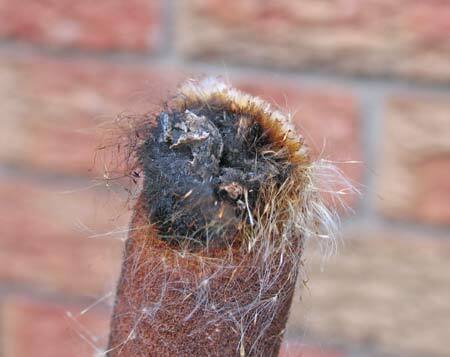 The best coal extender by far is Tinder Fungus! There's a whole section on Tinder Fungus here. Cattail heads make ok coal extenders. Various types of pith of plants may be useful as cola extenders. Here is a piece of mullein pith holding a coal very nicely. This is Mullein pith, still inside the stem. As mentioned above, Tinder Fungus is the most effective coal extender I know of. 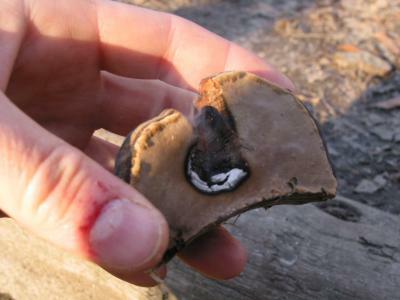 To carry a coal, set the piece of Tinder Fungus or False Tinder Fungus smouldering. Then wrap it in something to keep the air off it while you carry it. It needs to breath a little though, or the coal will go out. Experiment with ways of carrying it. 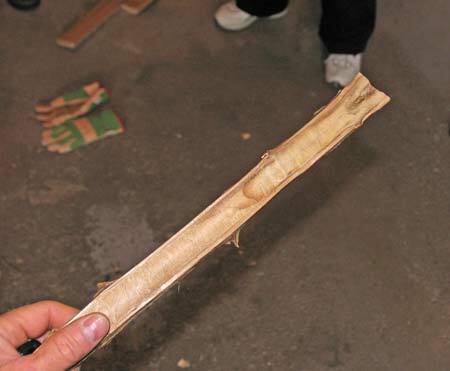 I have used birch bark wrapped around it, leaving a tiny hole at the top for the smoke to escape. Check it periodically to ensure that the coal hasn't spread - it has a tendency, especially if too much air gets at it, to spread and start to consume the entire piece of fungus. 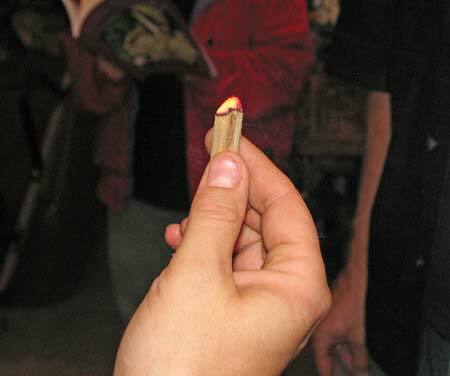 I was able to carry fire in a small 2" x 3" piece for about 2 hours, wrapped in a piece of birch bark. 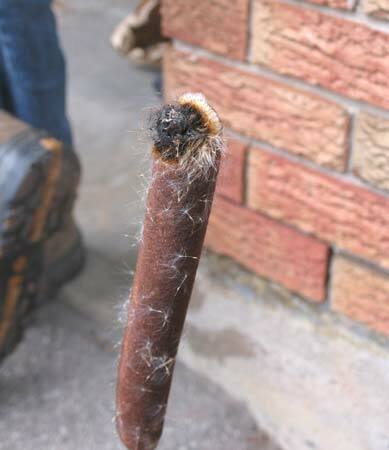 The fungus may get rather hot as the coal penetrates deeper into it. Makes a good hand warmer, though! 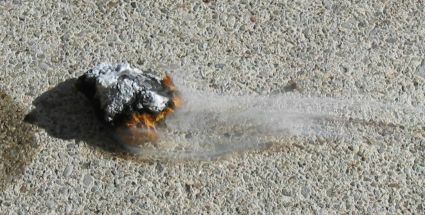 This photo shows a piece of False Tinder Fungus that has been smouldering for about 1/2 - 3/4 hour. Here's a close-up photo of a small piece of "True" Tinder Fungus that has been ignited with a magnifying glass. A variation on the theme of coal extenders is that of flame extenders. Here a lump of spruce sap is burning brightly. It will last for several minutes or longer, depending on the size of the lump.